This year I did not focus on my biodiversity list with the same gusto that I did in 2017. That is not to say, however that I gave up on my quest for biodiversity! Lists aside, 2018 was one of my best years yet as a biologist, naturalist, and photographer. 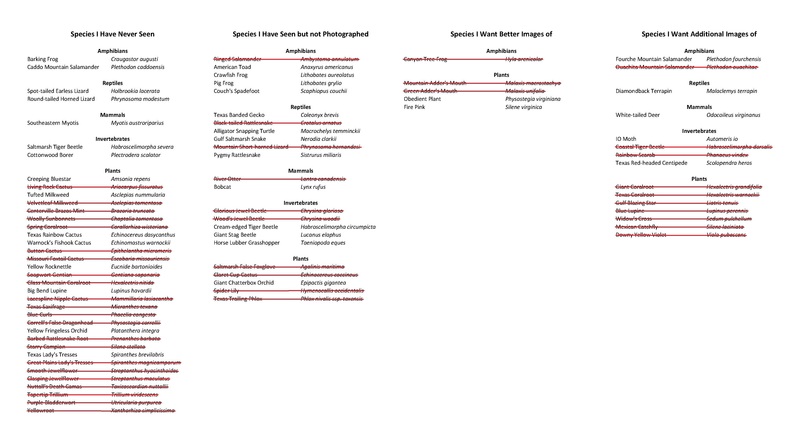 These addition of these species puts me at over half of my list complete (45 of 80 species). Perhaps the most exciting venture of 2018 was getting back into bird photography, thanks in part to my friend James Childress. In January, James, his wife Erin and I found ourselves pursuing birds along the Upper Texas Coast. We also spent some time chasing after local birds. In early February, as winter began to slowly turn to spring, my friend Scott and I found this beautiful Spotted Salamander (Ambystoma maculatum). Many of my favorite spring ephemeral wildflowers begin to appear by mid February. Bloodroot (Sanguinaria canadensis) may be my favorite of these fleeting beauties, and each year I try to find different ways to photograph them. In March, Caro and I traveled to the Lower Rio Grande Valley with James and Erin. During our trip James and I were able to photograph many South Texas specialties, as well as other more widespread species. During this trip I was also able to finally see the Federally Endangered Star Cactus (Astrophytum asterias) in bloom. We also had the opportunity to photograph a beautiful old Texas Tortoise (Gopherus berlandieri). Back in East Texas, Carolina and I spent many a spring day exploring the Pineywoods. We were rewarded for our efforts on many occasions, such as this group of Kentucky Lady Slippers (Cypripedium kentuckiense). In 2018 I made a concentrated effort to visit several of our great state’s ecoregions. For the first time we explored the Cross Timbers and Prairies. We found many beautiful landscapes in the Grand Prairie and Lampasas Cut Plain. This region is home to some of the most spectacular displays of wildflowers in the country. A highlight was finding several populations of Eastern Shooting Star (Dodecatheon meadia). We also found several large colonies of Nuttall’s Death Camas (Toxicoscordion nuttallii) on limestone ridges. And on a later visit we found fields of Narrow-leaved Purple Coneflower (Echinacea angustifolia), a species characteristic of the Great Plains. As the weather warmed, we found ourselves taking several trips to the Upper Texas Coast, where I spent time on my belly photographing the local bird life. I have been fascinated with beetles since childhood, and few are more impressive than the Ox Beetle. The animal below is Strategus aloeus, one of two local species of Ox Beetle. …and the Giant Coralroot (Hexalectris grandiflora), which we found deep in the Davis Mountains of West Texas. In the semiarid grasslands at the base of the Davis Mountains I was able to photograph several Pronghorn (Antilocapra americana). Back in East Texas we sought out orchids, like the Crested Fringed Orchid (Platanthera cristata) pictured below. In early September I had a chance encounter on a river sandbar with a Spotted Sandpiper (Actitis macularius) in basic plumage. At the end of September, after many failed attempts over several years, I was finally able to find and photograph an adult Ringed Salamander (Ambystoma annulatum). In December I was lucky enough to photograph a Northern Raccoon (Procyon lotor) on a trip to the Upper Texas Coast with Caro, James, and Erin. During that trip we also encountered several cooperative Seaside Sparrows (Ammodramus maritimus). My year reached its pinnacle on Christmas Day, when I shared a pond with some American Wigeons (Anas americana). 2018 will be a hard year to top, but I intend to give it my all in 2019. I wish all of you the best in this new year. This entry was posted in 2018 Highlights. Bookmark the permalink.